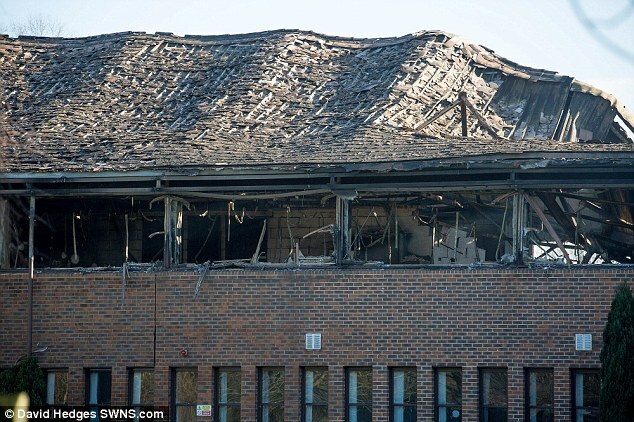 Did Enforcement Row Dating Back 30 Years Lead to Destruction of Oxon Planning Depts. 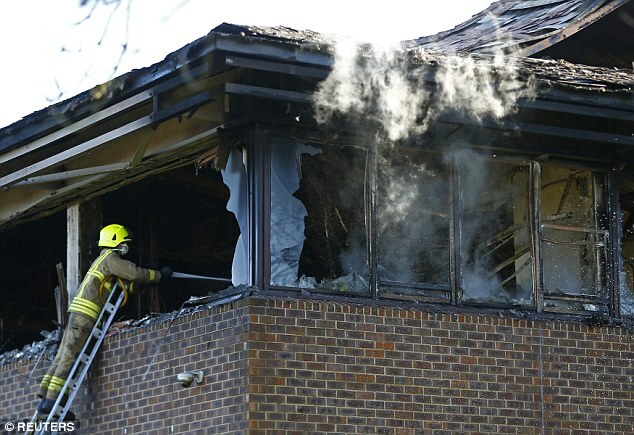 An arson attack on council offices which neighbours described as ‘like a bomb going off’ is believed to have been started after a planning application was rejected. 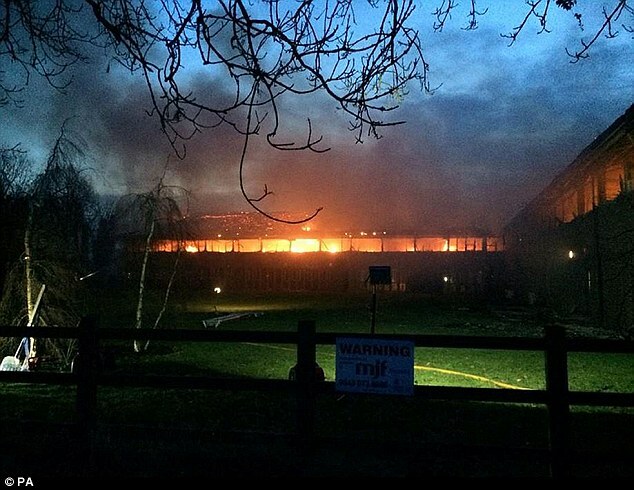 A 47-year-old named as farmer Andrew Main was being held tonight over the fires, the largest of which tore through the offices of South Oxfordshire District Council this morning. It destroyed windows and leaving little more than buckled frames, smashed windows and a caved-in roof behind. 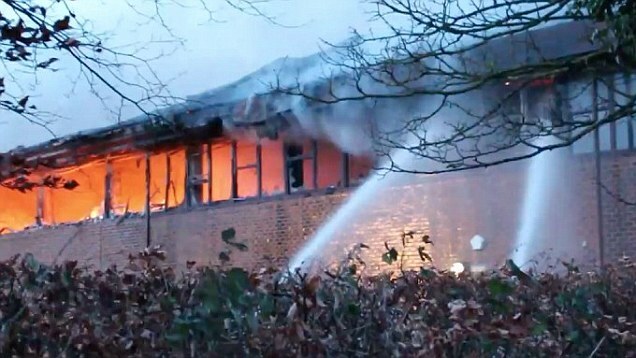 The fire at the council offices was believed to be part of a triple arson attack, motivated by anger over a long running planning dispute. Minutes earlier a thatched cottage in Roke Marsh was engulfed by flames while an 80-year-old woman was inside, along with a farm building next door, and a funeral parlour next to the council offices ignited after a gas canister was thrown into the doorway. 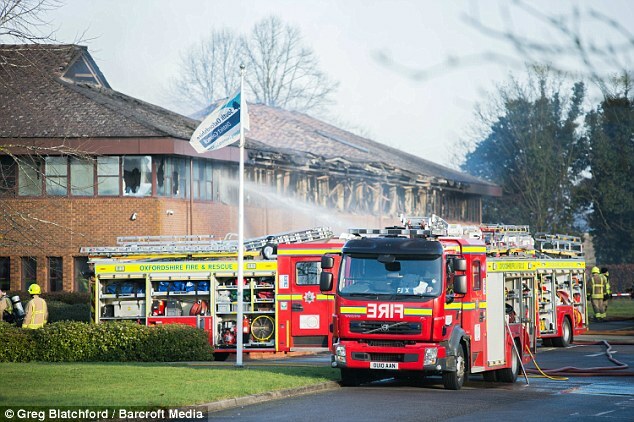 At the height of the fire at the council offices 27 crews from across Oxfordshire, Berkshire, Wiltshire and Buckinghamshire were called to battle the blaze, with flames up to 60ft high licking the council building and turning it into a charred shell. 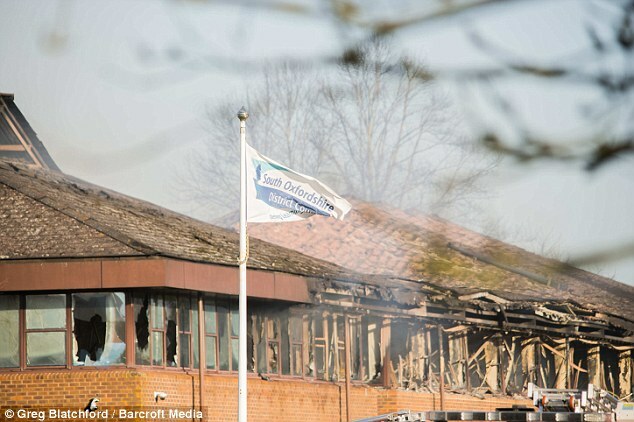 The arsonist was believed to have ignited a fire on the first floor of the local authority’s planning department, leaving it ravaged beyond repair. Gas canisters were found at each site and 30 residents had to be evacuated after police discovered a stash of canisters in a house in Roke Marsh and bomb disposal teams were called in. 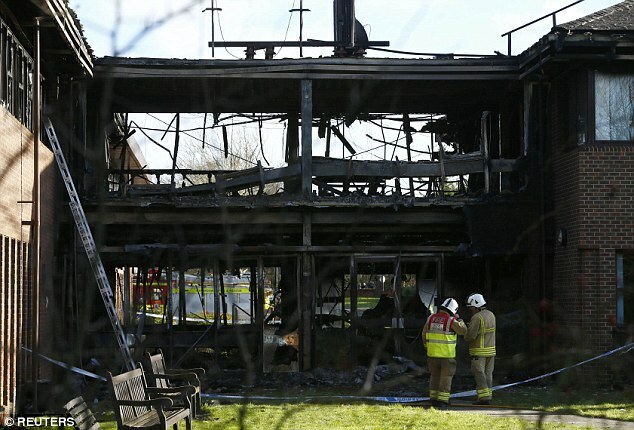 Police arrested a 47-year-old man on suspicion of arson in connection with all three fires. He is currently in custody and it was later confirmed his name is Andrew Main. The triple fire, which is believed to have caused damage running into millions, is understood to have been the result of a grudge attack because of a planning dispute. The building, believe to be on land at Roke Marsh Farm, was understood to have been built without planning permission and used as a storage site ever since. Neighbours said the dispute went back 30 years. 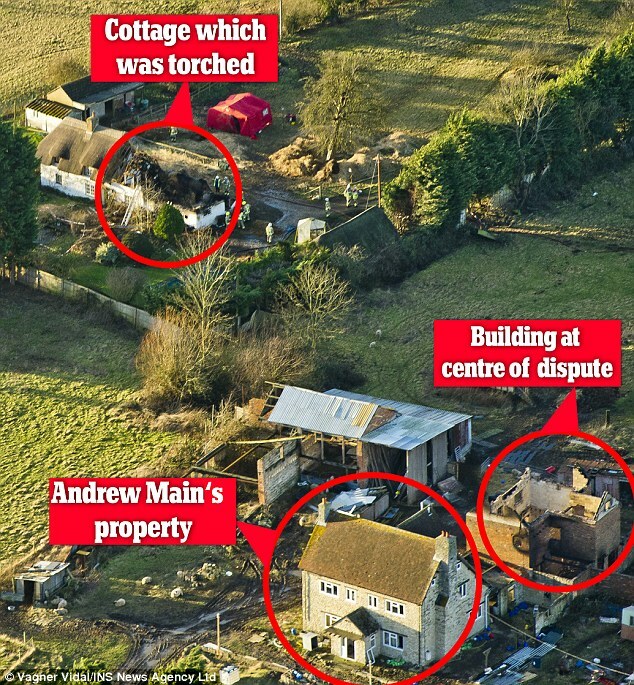 A source involved in the investigation said: ‘As far as we understand he was refused planning permission in relation to an application, perhaps to extend his own home, and as a result decided to go on a fire raising rampage which has resulted in the council offices being destroyed. 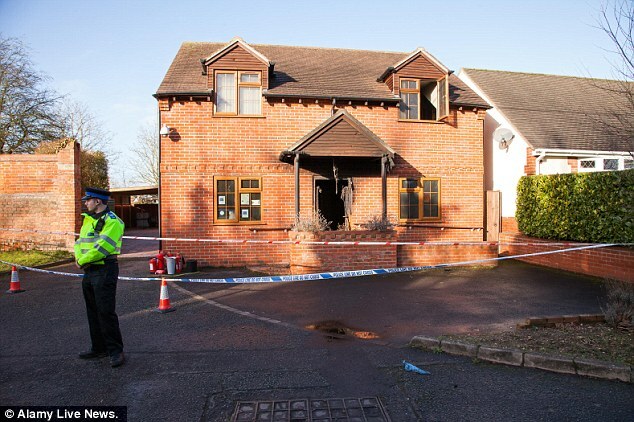 ‘We believe he started a fire with some accelerant in the doorway of a building alongside the council offices which serves as a funeral parlour, but it looks likely that he mistook the building for the local authorities’ offices. The man is thought to have driven into the council approach road before mounting a pavement and reversing his car to smash through the front doors. The car is believed to have been packed with gas canisters, and left a trail of destruction through the offices but did not start the blaze. 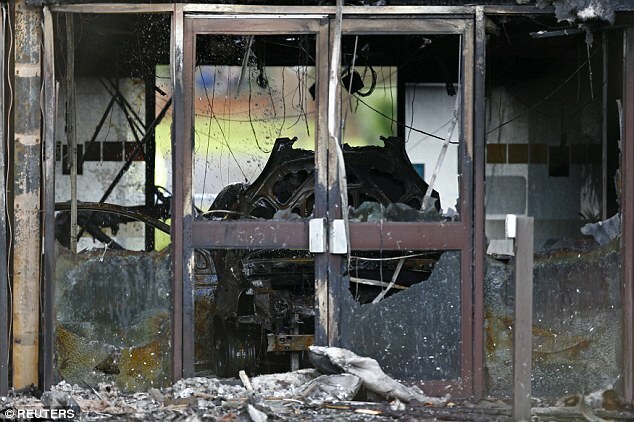 A separate fire is thought to have been started which then engulfed the car and the foyer of the council headquarters. At least half of the thatched cottage at Quakers Corner in Roke Marsh – the site of the first fire – was burned down in the blaze. It is occupied by Jean Gladstone, who escaped the fire unharmed. Liam Tiller, 68, said: ‘The building was put up without planning permission years ago and nothing has been done about it. ‘The dispute goes back over 30 years. I have heard a lot of people say there was some grievance over the planning authority but that must have been over something more recent because as far as I know the district council have left it too long to do something about that house. One neighbour, who asked to remain anonymous, said: ‘The house is not a particularly habitable one, I think they have not been able to develop it. ‘They tried to sell that piece of land a few years ago and they couldn’t. When it didn’t sell I think they tried to do some planning on it but I don’t think he ever got what he wanted. ‘They have always wanted to develop on that bit of land but they have never been allowed. Another neighbour, Geoff Williams, 78, also said a number of planning application had been turned down for the farmland. ‘I would have thought Jean would probably object to any applications that went in because it would more or less adjoin her land,’ he said. 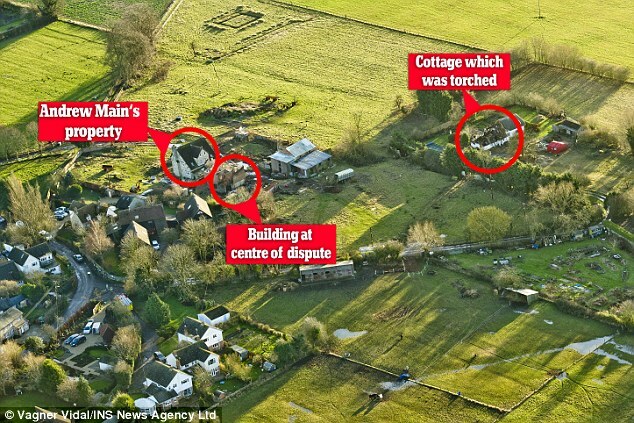 ‘There was a house that was partially built on the farm that I don’t think had planning permission. ‘There were also some planning applications on both sides of the lane which were turned down. I have probably never spoken to the suspect. I know of him and he has his name on the gate at the entrance to his property and he breeds sheep in the fields. 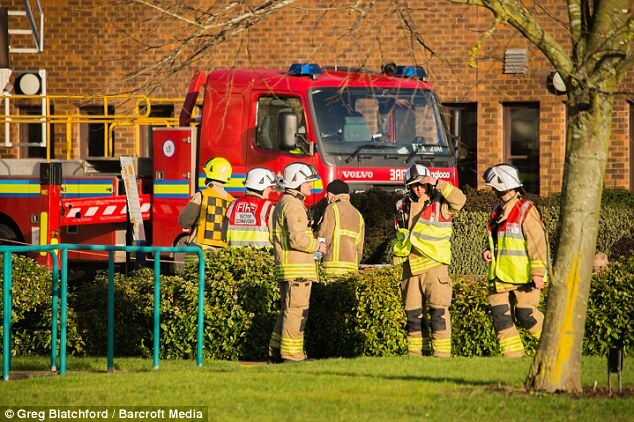 People living near to the council offices in Crowmarsh Gifford described a car being driven into the foyer of the council building, usually home to around 400 staff from South Oxfordshire District Council and Vale of White Horse District Council. Adam Beasley said the fire was described as an explosion by his parents, who live nearby. He told Sky News: ‘My mother said it was like a bomb, then very quickly the police were on the scene, and fire engines followed soon after. ‘In photos you can see a car which was parked up in the foyer. It’s plainly an attack involving gas canisters, which would be like a bomb going off when it exploded. Mr Beasley said he thought the fire at the funeral parlour was a case of ‘mistaken identity’, with someone having believed it was part of the council. But he could not understand why the house, a few miles away, had been attacked. Ian Negus said he heard an alarm at around 3.15am before ‘popping and cracking’ a short time later. 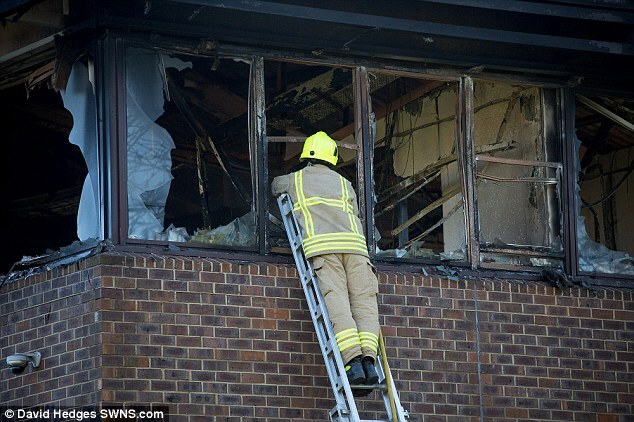 The 34 year old said: ‘I looked out of the window and there was a massive fire right in the middle of the building. ‘I went out to have a look and it was just total devastation. ‘The wind was howling across the field and fanning the flames, which were about 60ft high. It was so intense. ‘There must have been 100 firefighters here trying to put it out. 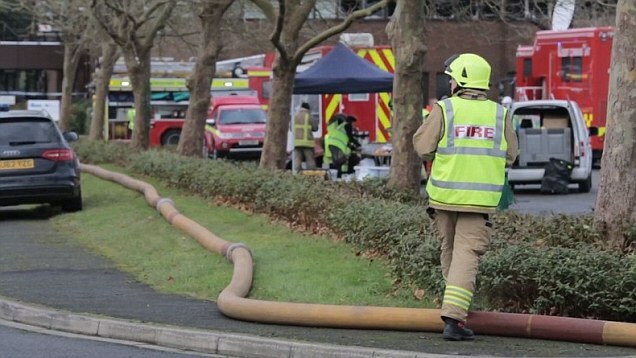 Bomb disposal teams were called to help dispose of the gas canisters found at a separate property in Roke Marsh, as well as at the council buildings, and left the scene at about 1pm today. At a press conference, Superintendent Andy Boyd said gas canisters were found at all three sites of the fire and they were currently investigating at another building in Roke Marsh where a stash of gas canisters was found inside. He said: ‘All three fires are being treated as suspicious. 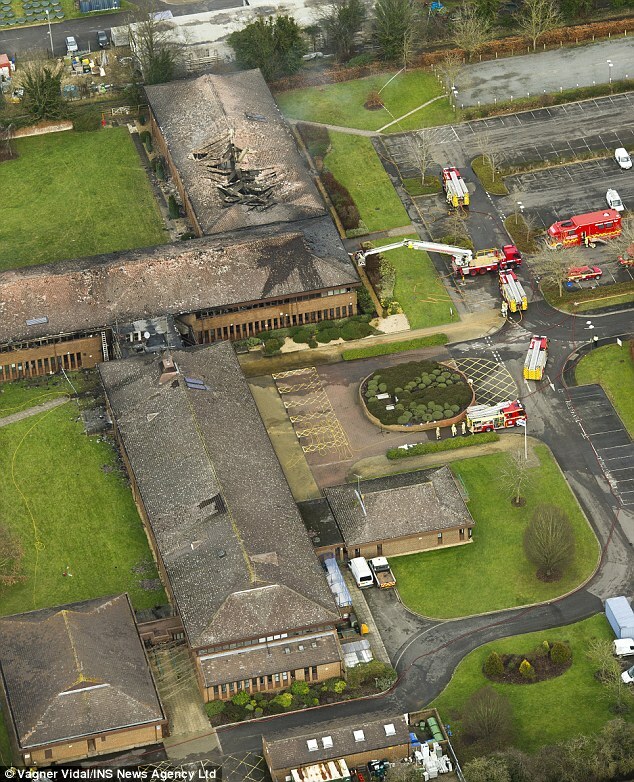 We believe a vehicle collided with the South Oxfordshire District Council building prior to the fire. 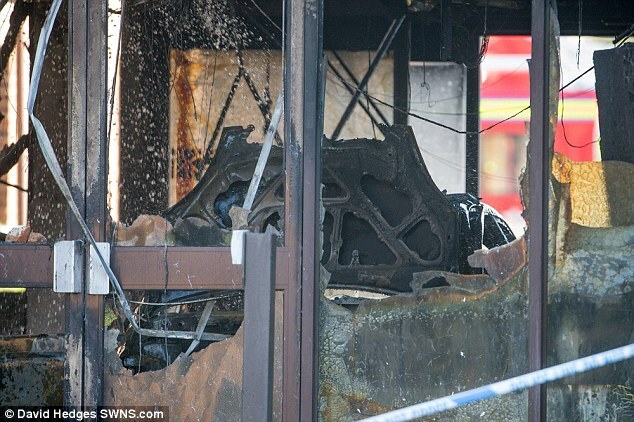 He confirmed gas canisters were found ‘in the vicinity’ of the car, which has been seen in the wreckage of the building being examined by experts. Supt Boyd confirmed they were also searching a property in Roke Marsh, and gas canisters had been found. Around 30 people were evacuated from nearby homes and were allowed to return at about 3pm. One evacuee, Simon Williams, said he and his family lived next door to the affected houses. The 56-year-old said he was woken at around 3am by the smell of smoke and crackling noises outside. 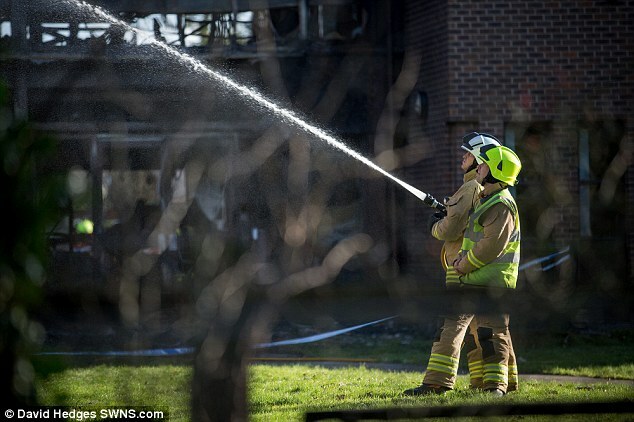 Mr Williams, a management consultant, said: ‘The next thing the dogs were barking and the neighbours were banging on our door to warn us to get out because there was a fire. ‘We quickly gathered our troops and got outside and saw flames flying across the garden fence. Mr Williams said villagers gathered together as fire crews battled to save the properties, one of which was understood to be empty. The father of two did not identify the elderly woman who lived in the thatched home but said: ‘She is a fantastic friend and neighbour and a strong trooper. We are very pleased that she is safe and well. Mr Williams said evacuees were brought to the village hall at around 6.30am but did not know when they could return home. ‘All we know is that they are doing investigations at the scene,’ he said. ‘We’re not getting a lot of information through. 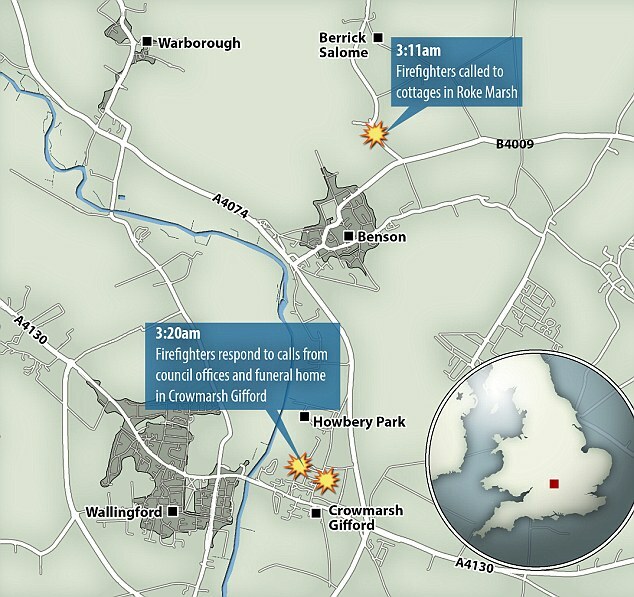 The fires were started within quick succession of each other at the three separate sites. Firefighters received a call about a fire at a cottage in Roke Marsh at 3.11am and 10 crews were sent to the scene. Then nine minutes later four crews were sent to battle a blaze at a funeral parlour in Marsh Lane. 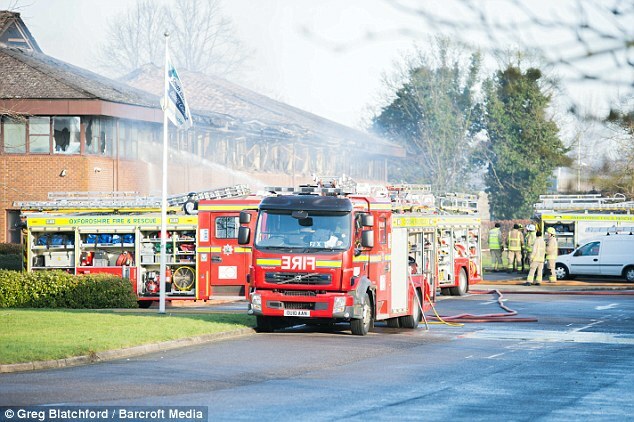 Just seconds later a call was received reporting a fire at South Oxfordshire District Council’s offices at Crowmarsh Gifford, next to the funeral parlour. 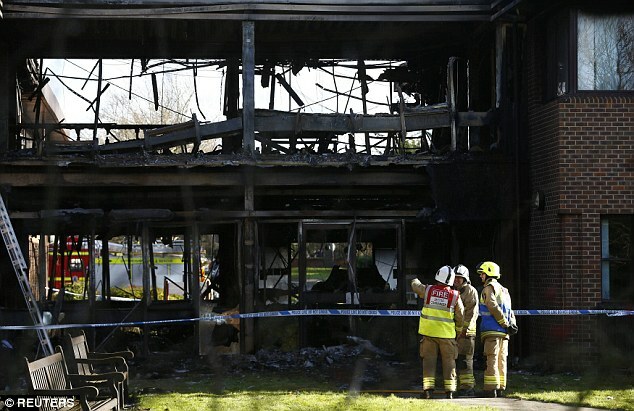 Thirteen crews from Royal Berkshire Fire and Rescue Service attended the incident. Witnesses reported seeing flames 60ft high coming from the council building and plumes of smoke miles away. 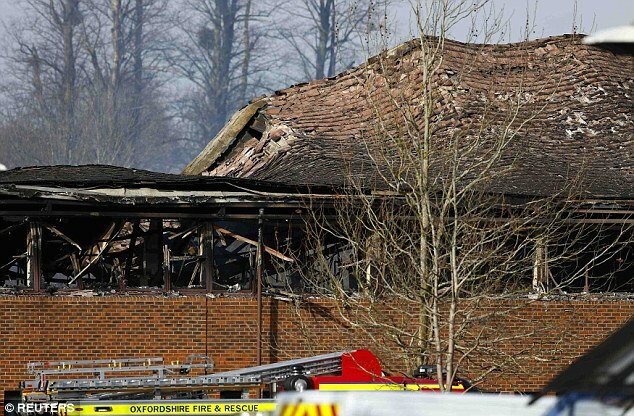 South Oxfordshire District Council said most of its services have been affected by the fire. 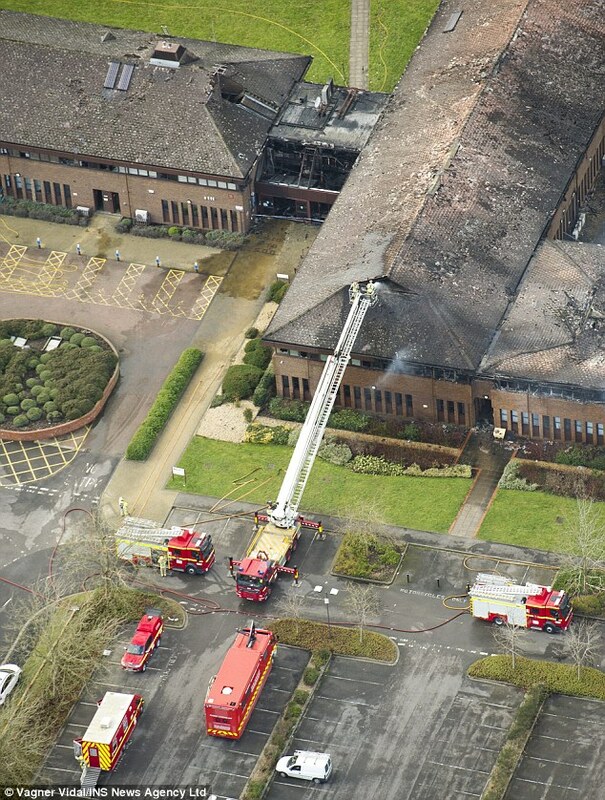 The headquarters of both council offices have been almost completely destroyed by the blaze and services are expected to be disrupted for much of the region for the next few days. 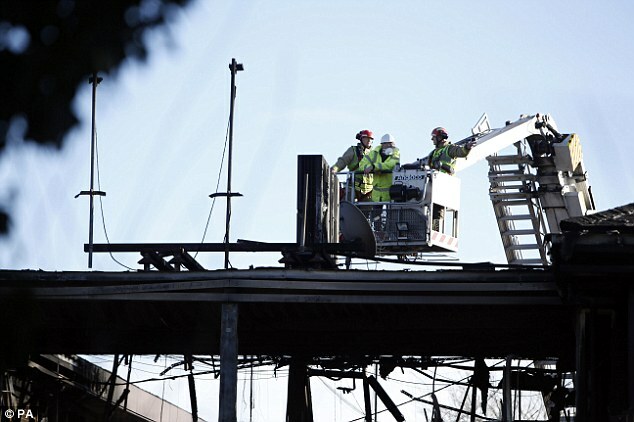 Witnesses said most of the building, which has scarcely any windows left and a roof visibly caving in, had been destroyed and they suspected it would have to be completely demolished and rebuilt. 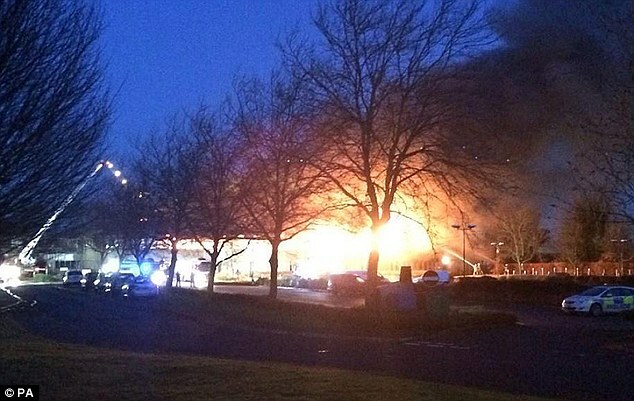 Howard Chadwick, owner of Howard Chadwick Funeral Service which was set alight, was alerted that the building was ablaze by the building’s alarm system, and put the fire out himself. Neil Cox, 73, funeral director, said he heard at noise at about 3am and then saw a car drive away quickly. He said: ‘The offices of the funeral home were on fire, so I phoned the owner Howard, called the fire service and we tried putting it out with fire extinguishers. Workers said they believe the funeral parlour, which is next door to the council, was probably set alight in error because it was presumed the building was part of the council site. They confirmed that the fire was quickly brought under control and no bodies had been damaged in the blaze. A police spokesman confirmed there had been no reports of anyone injured. Adam Beasley said the fire was described as an explosion by his parents, who live nearby. He said: ‘Earlier on I spoke to my mate, who runs the funeral business. 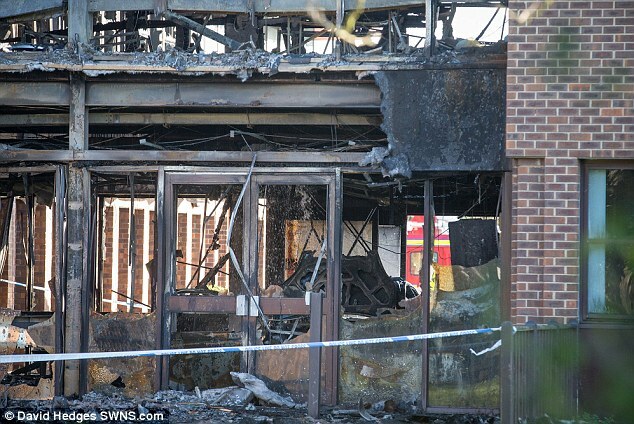 I could see the damage to his business, and the council offices are not looking too good either. 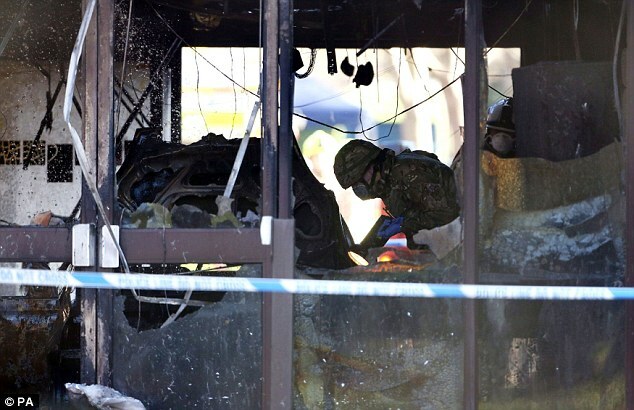 ‘My mother said it was like a bomb, then very quickly the police were on the scene, and fire engines followed soon after. 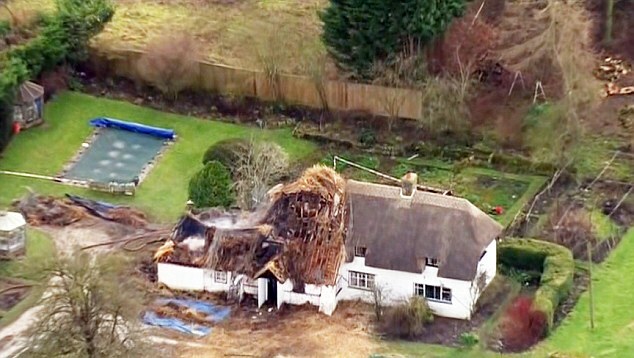 The roof of the cottage, in an area where properties are worth almost £700,000, was also badly damaged. Its 80-year-old occupant managed to escape the blaze unharmed. 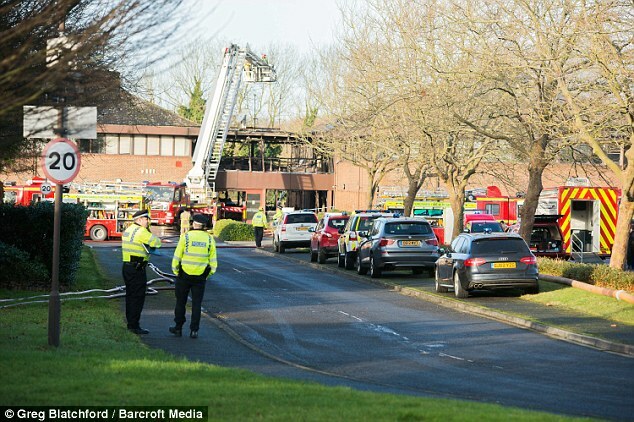 In a statement Thames Valley Police said: ‘Officers were called at 3.24am to Benson Lane, Crowmarsh Gifford where a fire was reported at South Oxfordshire District Council (SODC) building and another at a nearby commercial property. 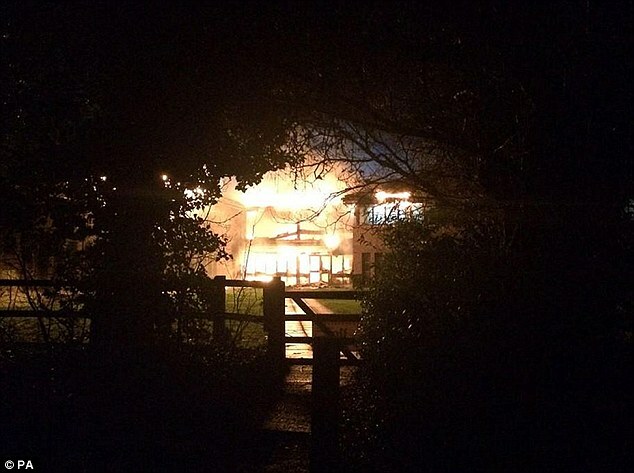 ‘At 3.41am officers were called to a third fire at a property in Quakers Corner, Roke Marsh. ‘There are cordons in place at all three locations and residents and motorists are asked to avoid these areas. ‘Nobody has been reported injured at this time as a result of these fires, however following these fires the structures of the buildings affected are being examined for safety. 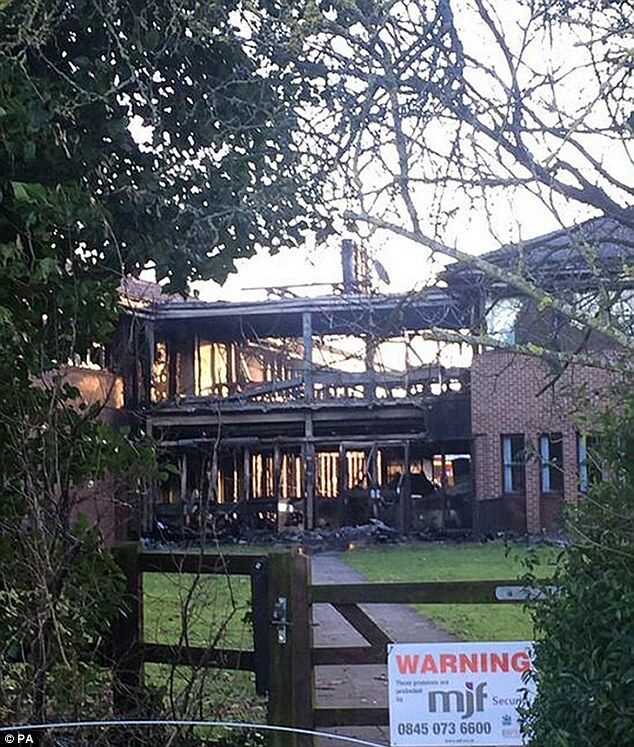 John Cotton, leader of South Oxfordshire District Council, said that emergency services such as housing and homelessness will still be available today but that a number of services were run from the building – including housing, planning and leisure. 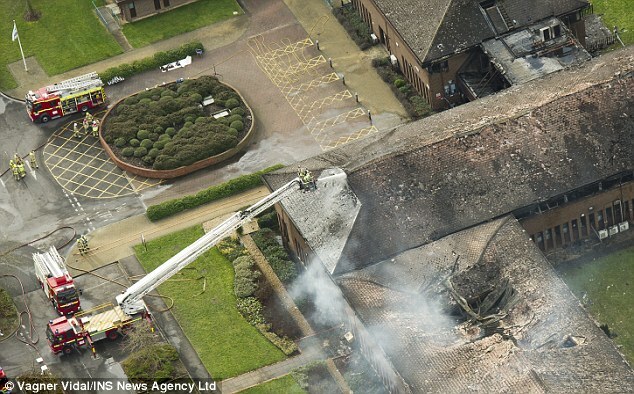 He told Sky News: ‘It looks like the building are fully destroyed. Neighbouring councils have been offering support and staff are believed to be working from home where possible. Persimmon has warned of the challenges ahead in delivering new homes, as local planning authorities begin to “sit on their hands” in the run-up to the general election. Yes but Pickles and Lewis are in the vanguard of this, witness the recent Cranleigh clal in, just to get the decision the back of the election. They’ve tried everything from carnal-themed masses to baby-ready dating sites, “date night” childcare, ad campaigns and even prize draws for positive pregnancy tests. But now, the citizens of rural Denmark have come up with another idea to boost the country’s flagging birth rates. People in the Danish municipality of Thisted, in north-west Jutland, have agreed on a deal with the council to procreate as much as possible over the next few years to help maintain underpopulated public services. In return, the local politicians have promised to keep schools, nurseries and leisure facilities open – on the condition that parents produce enough new children to fill them. The problem is a falling birth rate and rising dependency ration (ration of non working age population to working age population) is a key issue in much of the developed world. Especially in Japan, Italy and Germany. Cechetti at the Bank of International Settlements even draws a link between the end of the working age of the baby boom generation and debt servicing problems leading to financial crises. Their is a difference between the demographic dependency ratio and the economic one (ratio of people in work and those retired or unemployed) but there is unfortunately no clear statistical set for the latter across countries. A challenge for a graduate student i’m sure. In England the issue is more complicated. There is a dramatic difference between the birth rate of families which have lived in the UK for a generation or more and those who have migrated to England. Migration watch UK stirred controversy last year with a report on migrant birth rates. the birth rate (strictly speaking, ‘total fertility’) in the UK is currently 1.83. However, as the birth rate required to sustain a population is approximately 2.1, any long term population increase in the UK can only be as a result of immigration…. if there were no migration at all, and if fertility remains constant and mortality continues to decline. The population continues to grow at a diminishing rate for quite a long time– until about 2041 – under the momentum of the age-structure and from longer survival, before gradually declining. On ONS assumptions (but without migration) it would return to its present size towards the end of the century. By contrast, the current ONS Principal Projection (which includes a net migration assumption of only 165,000) would give a UK population of 90 million at the end of the century. Even under the Migration Watch data (not known for its accurate use) under a ‘zero’ net migration scenario the population declines (and dependency ratio increases) by about 1 million every 10 years. What this means is that if England wishes to avoid a dependency ratio contributing to the kind of long term stagnation we see in Japan the current total fertility needs to increase to 2.1 from 1.83 – in other words we need 15% more babies to avoid dependency ration related increases in taxes and debt repayments in other words to retain our current wealth. So those who claim we cant afford immigration because the school are full, ‘you cant get a GP appointment’ etc. are missing the point. The schools and surgeries would be even more crowded with a zero net migration policy designed to maintain the dependency ratio and our current ability to service debt. There is a clear three way trade off between immigration, birth rates and debt servicing. If you want to stop immigration with low birth rates prepare to transfer more of societies income to rentiers. Also debates about the economic costs and benefits of immigration need to be clearer about what the policy on and policy off scenario is, taking into account costs of debts servicing, distributional impacts and counterfactuual policy alternatives designed to maintain dependency ratios. So to those who complain about immigration at a village hall meeting complaining about new housing ask them how many kids they have. If they have had less than three or four sorry its your fault.